Growing anything from seed is a fun and satisfying project. Vegetables grown from seed are a great way to help children connect with the food they eat. Ask your students what the first step is for growing a vegetable and begin a dialogue about growing green or yellow squash from seed. Discuss how vegetables are important for a healthy diet and how growing your own can help cut costs for family shopping lists. Share with your students that each squash seed can produce a plant that can grow many squash vegetables all summer long. Have a yellow or green squash displayed next to a squash seed and let your students observe the difference in appearance. Ask your students if they know that squash plants grow flowers. The flowers are the first part of the vegetable to grow. The flowers can be stuffed with ingredients like a soft cheese and sautéed in olive oil or eaten raw. Many farmers’ markets have the squash blossoms available before the crops of squash start to explode. A farmer knows how to identify the two kinds of flowers the squash plant grows. One is the male flower, picked for use as a blossom to eat, and the other is the female blossom. The female blossom will grow the vegetable. Point out to your students that farmers need to know the difference in the squash blossoms, so they can leave behind the female blossoms, or they would have no crop of yellow or green squash! For this project, have your class bring in clear egg cartons. Discuss with your students that they are doing a planting project as well as recycling an egg carton. Share how the clear egg cartons will act as a mini-greenhouse for the seeds to be in a warm environment and start to grow. Ask your students what a seed needs to grow. You can find seed starter mix in a garden center, and some supermarkets, in the spring. You don’t want regular potting soil for this seed project. The seed starter mix is much lighter allowing the seeds adequate moisture and easy germination. Place a bit of the seed starter mix in the holes of each space in the empty egg cartons. Students can poke a hole with a pencil to create a well in the mix. Have your students place the seed in the hole and cover with some more mix. Using a spray bottle, mist the top layer of the mix until evenly moist. (You don’t want to pour water, as it would flood the well, and the mix needs to be just dampened.) Close the lids securely. Place the cartons in a sunny, or warm, location by a window or radiator. Your students should be able to observe condensation in the cartons fairly quickly. This is what the seed needs to germinate. The warmth of the environment, and the constant level of humidity in the carton, is how it acts like a greenhouse. Watch the condensation in the cartons and keep spraying to maintain humidity levels. The seeds should germinate in 7-10 days. 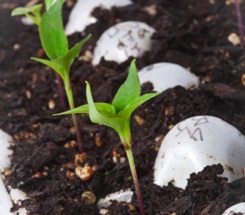 Have your students chart their observations from the first day of planting the seeds. The cartons can easily be cut to send students home with two, four, or six plants each. Instruct your students to plant the squash plants somewhere with some room to grow. The plants can be grown in containers too. Here’s to healthy eating!